When J. Pierpont Morgan's International Mercantile Marine Co. was created in 1902, it acquired the White Star Line and several others. IMM soon decided that White Star was its principal asset, and transferred to White Star the newest and best of the ships then owned by some of its other companies. One of those was the Dominion Line's Columbus, which had been built by Harland & Wolff, Belfast, and put into service on Dominion's Liverpool-Boston route on 1 October 1903. 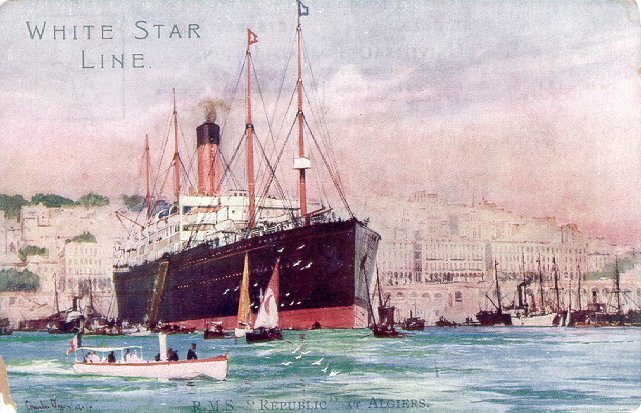 After two roundtrips, Columbus and the Liverpool-Boston route were transferred from Dominion to White Star, and Columbus was renamed Republic. She was the second White Star ship of that name. 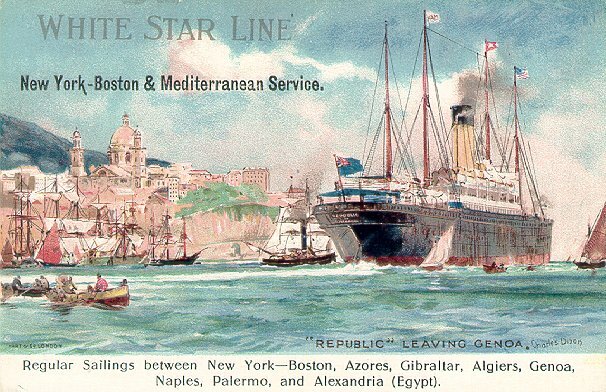 For the next five years, Republic spent fall and winter on White Star's Mediterranean service, from Boston in early 1904 and thereafter from New York. Spring and summer saw Republic on the Boston-Liverpool route. All that ended on 23 January 1909, near Nantucket. On that date, while outbound from New York, Republic was rammed by the Lloyd Italiano liner Florida, which was headed to New York. Water began entering Republic's engine room on the ship's port side. All of Republic's passengers and most of her crew were taken off by Florida. 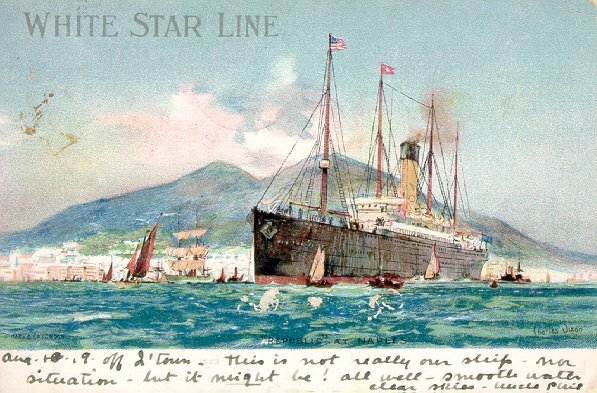 Later, White Star's Baltic (II), summoned by Republic's wireless operator, Jack Binns, arrived on the scene and took all of the passengers from both Republic and Florida -- some 1,260 in all -- to New York. Florida also headed for New York, escorted by the American Line steamer New York. Meanwhile, two U.S. revenue cutters, Gresham and Seneca, and Anchor Line's Furnessia attempted to tow Republic to safety. However, at around 8 pm on 24 January, Republic sank in 34 fathoms of water, off Martha's Vineyard. She was the largest liner lost at sea to that time. Remarkably, due in large part to Binns' heroic efforts, only six lives were lost, and those deaths resulted from the initial impact between the two ships. Ironically, on 12 December 1917, Florida was also lost in a collision, with the Italian auxiliary cruiser Caprera, near Armevilla. For more in-depth information on the Republic, visit The Official RMS Republic Website.